Are you wondering if there is a better way to create and manage your Purchase Orders and Purchase Requisitions without investing in a dedicated and expensive system? Well there is a better way because with FormDocs Electronic Forms Software you can easily create and fill-in customized Purchase Requisition and Purchase Order Forms that display information exactly the way you want to see it. And best of all, because it's an electronic form, a FormDocs form template can do things that plain old paper forms can't! 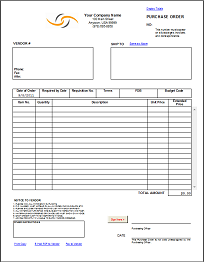 Your Purchase Requisition and Purchase Order Form templates are automatically customized with your business name, address, phone number and your company logo. Safely store all completed forms in one central Forms Database so that you and others can quickly search, sort, locate, share, and print any form in just a few seconds. 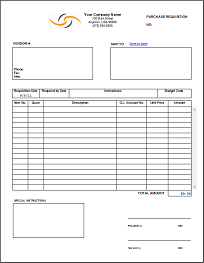 In addition to our customizable Purchase Requisition and Purchase Order templates, use or customize any of our free ready-to-use sample business form templates, convert your existing paper forms or PDF files, or design your own custom forms with our simple-to-use Form Designer. If you already have vendor and parts data in your own databases and spreadsheets, you can easily link that data to your forms for automatic fill-in, enabling you to simply select Vendor IDs and frequently purchased Part Numbers so that you'll spend less time typing. Easily define calculations so that multiple rows, tax rates, shipping fees, and totals are automatically and accurately calculated. Easily add automatic Sequence Numbering and date-stamping. Enter an unlimited number of line items using scrolling tables; extra pages automatically print as necessary. Mirror your standard workflows by routing forms among staff members for their input and to supervisors for their review and approval*. Staff members making requests and supervisors granting approvals can indicate their identity using 'point & click' digital signatures or by applying their handwritten signatures using a Windows Tablet computer or popular signature pad devices*. Directly fax or e-mail a 'view-only' copy of a completed and signed purchase order to your vendors so that they can read and print it without needing to have FormDocs installed on their computer. Export information from a completed form and import it into your back-end databases, spreadsheets, or accounting system. Scan and convert your paper forms, or Convert MS Word and Adobe PDF files into fill-able FormDocs forms. All together, FormDocs' powerful and intelligent Electronic Form features can help you to improve your purchase requisition and purchase order processes, eliminate manual errors, and reduce the hours spent each day on 'backroom' paperwork. A typical scenario is the following: you complete a Purchase Order or Purchase Requisition form which then needs sequential review and approval by multiple persons. Using FormDocs forms routing feature, you create a 'routing slip' which will automatically send the form to your list of recipients in the order you specify; upon reviewing the form, each recipient has the option to indicate their approval by digitally signing it and then 'routing' it on to the next person or, they can return it to the sender for requested corrections or additions. Learn more about Digital Signing and Forms Routing.